Los Glaciares National Park is the second largest national park in Argentina. Declared a national park in 1937, it’s also been a UNESCO World Heritage Site since 1981. Its name is derived from the giant ice cap in the Andes mountain range. This ice cap is the largest in the world excluding the ones found in Antarctica and Greenland. There are two lakes situated in the park – Lake Argentino and Lake Viedma. These lakes feed into the Santa Cruz River, which in turn flow into the Puerto Santa Cruz on the Atlantic. 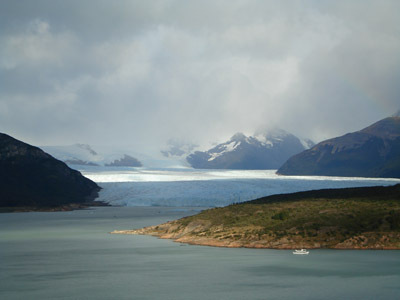 The northern part of Los Glaciares is entered through El Chalten. People visit this side of the Los Glaciares mainly for the trekking and hiking. The mountains of Cerro Fitz Roy and Cerro Torre are the most popular among climbers. The gateway to the southern part is El Calafate on Lago Argentino. On this side of the park, visitors can ride boats and go sight-seeing among the glaciers of Perito Moreno, Upsala, Spegazinni, and Onelli. While Perito Moreno can also be accessed by land, the last three can only be reached through motorboats. Travel between the northern and southern parts is also an adventure. Hardy tourists can soak in the scenery while roughing it out on a four-hour drive over gravel and dirt roads. There are several tour operators who offer rides to make this trip but more adventurous travelers can opt to rent a vehicle and drive themselves. It is important to have sufficient gas, experience in driving on all-weather roads, and knowledge of vehicle maintenance if you wish to take this trip. There is only one stop between El Chalten and El Calafate, so proper preparations must be made. The best time to visit the park is from October to March. intend to visit argentina after my bolivia tour from uyumi bolivia end november 2011 with my family, pls introduce the local travel agency for patagonia, iguazu.